Discover the deliciousness of Dilettante's Bing Cherry Dragées! A dragée is basically a colorful covered candy that is harder on the outside and softer on the inside. Our cherry dragées are all natural dried bing cherries coated with a blend of high-quality milk and dark chocolate. The final, outer coating is made of pure white chocolate that has been colored to a beautiful, deep red hue. When you bite into one of these yummy morsels you get a firm textured, semisweet chocolate followed by a chewy, fruity cherry center bursting with flavor. The dragées are made in Dilettante's special revolving kettles that cover each fruit piece with two smooth, even chocolate coats. At Dilettante, we are dedicated to creating superior products. All of our gourmet chocolates are made with pure, natural ingredients to create rich-tasting, high-quality goods. In making our chocolate covered cherries we use premium quality white, milk and dark chocolate along with dried bing cherries fresh from the Pacific Northwest. There are many possibilities of how you can use these tasty treats. 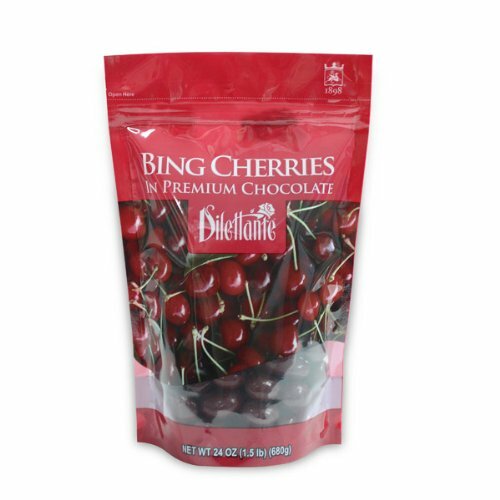 Your order will include TWO resealable pouches of Dilettante's Bing Cherry Dragées, 24 ounces per pouch. We will ship the chocolate covered cherries direct to you from our warehouse.